Often, we receive queries on how to get rid of dark circles. Before finding a remedy, we need to understand why we get dark circles below our eyes. Dark circles appear because the skin is very thin below the eyes and the flow of blood in the veins is more visible in some people than the rest. In most cases, dark circles are hereditary and only a cosmetic problem. Other reasons may be age, anemia, lack of sleep, allergies, eczema, liver problem or some medications. Unless there is an underlying health problem of which dark circles are a sign, there is no cause for worry. However, since dark circles are concerned with a person's appearance, the cosmetic industry has cashed in on the demand for a 'cure'. In majority of the cases there is no permanent cure for dark circles. 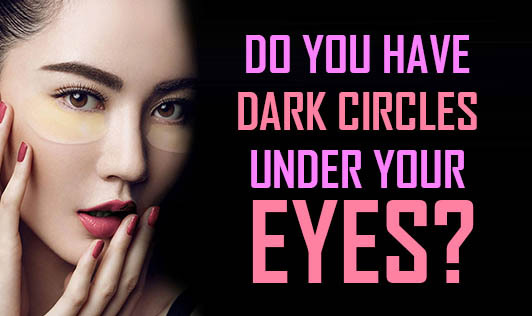 There are several home remedies for dark circles which may help to reduce the 'darkness' of these circles but will not get rid of them. The beauty industry has make-up products that can hide the circles but the circles become visible after the make-up is washed off. Some treatments are also used by dermatologists to reduce the prominence of dark circles but the effects may not last forever. It's best to check with your skin specialist what would suit you. Learn to love yourself for the way you are. After all, everyone has some flaw and nobody is perfect!